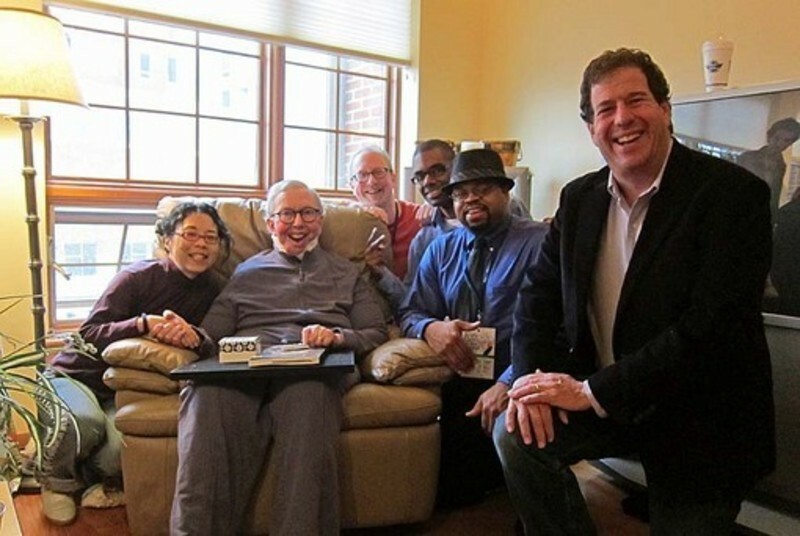 Above: The Demanders: Jana Monji, Roger Ebert, Jim Emerson, Steven Boone, Odie Henderson, Donald Liebenson. In absentia: Jeff Shannon, Kevin B. Lee. Reflected in TV: Wael Khairy. Steak 'n Shake shake courtesy of Michal Oleszczyk, who also took this photo with my camera. Every once in a while circumstances have conspired to keep me from attending Ebertfest, but the main thing that draws me back are the people I get to see and watch movies with while I'm there, from David Bordwell (with whom I rode from Madison to Champaign-Urbana) to Festival Co-Conspirator Joan Cohl to The Man Himself, Roger Ebert, whose presence animates the event, even when he isn't in the on-stage spotlight. I'm happiest hanging around, in the Virginia Theatre or the "green room" (where participants gather for lunch and dinner) with, to name but a few, some of The Demanders (a small group of writers I work with who cover VOD) or the Far-Flung Correspondents, who write about movies from their home bases all over the world: Egypt, Brazil, Turkey, South Korea... even Chicago. For some reason I have the notion that the guy with the camera, getting the low-angle shots of Barbara Jean (Ronee Blakley) against that American flag that stretches across the Parthenon from sea to shining sea, is the cinematographer Paul Lohmann. Is that right? I didn't know it at the time, but 35 years ago the course of my life was set into motion. It began, no doubt, the previous summer with Roman Polanski's "Chinatown," followed the next June by Robert Altman's "Nashville." If those two movies -- seen at the impressionable ages of 16 and 17 -- don't thoroughly transform your world, then I don't know what would. I'd always loved the arts, but from that moment on I knew for certain that movies were the art form of the century -- my century -- because never before could such vibrant, kinetic masterpieces have been born. They made me feel fortunate to have come into the world just at the moment in human history when, at long last, such miracles became possible. When the doctor says you're through Keep a'goin! Why, he's a human just like you -- Keep a'goin! -- Haven Hamilton (Henry Gibson) in "Nashville"
View image 24 of your favorite stars. -- Kurt Cobain, "Pennyroyal Tea"
-- Leonard Cohen, opening lyrics for "McCabe & Mrs. Miller"
"However, the cortex, which is dwarfed in most species by other brain areas, makes up a whopping 80 percent of the human brain. Compared with other animals, our huge cortex also has many more regions specialized for particular functions, such as associating words with objects or forming relationships and reflecting on them. The cortex is what makes us human." -- John J. Ratley, M.D., "A User's Guide to the Brain: Perception, Attention, and the Four Theaters of the Brain"
Pauline Kael's famous, ebullient review of "Nashville" here reminds us how exciting and innovative the movie was in 1975.